Mr. Foreman graduated with honors from Queen's University in 1992 and has worked in a wide spectrum of geological environments involving both base and precious metals. 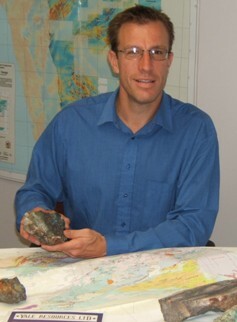 He has worked for various junior mining and exploration companies in North and South America. Throughout the mid 1990's Mr. Foreman worked on a series of large multi-million dollar exploration programs in British Columbia, Yukon and Mexico. From 1998 through 2002 Mr. Foreman worked on various projects exclusively in Peru. As Chief Geologist, he was a key figure in putting the 1,000 tonne-per-day Santa Rosa open pit gold-silver mine into production. Yale Resources Ltd. is an exploration and development company building value utilizing the Project Generator business model. With its Mexican operations based out of Hermosillo, Sonora, Yale is utilizing its extensive Mexican network to identify, acquire and advance projects of merit. Yale's partners are scheduled to spend greater than $1,000,000 on exploration on the Company's properties over the next 12 months. CEOCFO: Mr. Foreman, Yale Resources has a rather unique business model. Can you please explain the Project Generator Model? Mr. Foreman: The Project Generator business model historically has been one of the most successful in our industry. A Project Generator acquires undervalued projects then advances them and/or incubates them. We then look for other resource companies to acquire a percentage interest (an option) by making staged payments, share issuances and exploration commitments over a number of years. Upon successful completion of an option Yale would then have a minority interest in a project but that project would be much more valuable as a result of the dollars spent. CEOCFO: What came into play in deciding on the plan? Mr. Foreman: We realized that we had an enviable 'pipe line' for future projects and that we couldn't possibly explore all of them on our own. We were aware of the business model from our previous years in the industry and put the plan in place during the last big downturn in the market. CEOCFO: Any bumps in the model that you look out for? Mr. Foreman: We didn't realize how long it was going to take to become a recognized "Project Generator"... in fact I don't think that our shareholders fully grasp that either. We are also aware now as to why there aren't many project generators - it is very difficult to do well. Just because a company options out one of their projects, it doesn't make them a project generator. We are very much involved in each aspect of the exploration of our projects as they grow, which, in turn, requires more time and manpower. CEOCFO: Is there a geographic or mineral specific focus or are decisions opportunistic? Mr. Foreman: Yale concentrates solely in Mexico with a focus in the northwestern states of Sonora and Chihuahua. CEOCFO: How does Yale compare with other Project Generator companies? Why are companies working with Yale? Mr. Foreman: Yale has a much smaller market cap. than other Project Generators. Companies option projects from Yale because we have quality projects and we provide great support to the companies that option our projects. It is important to us that we are able to provide a wide range of services to and for the companies that option our properties. As such we have very strong relationships with some of the best service providers in Mexico - labs, drilling and geophysics to name a few. CEOCFO: What is the financial picture at Yale today? Mr. Foreman: Yale has approximately $600,000 in cash and securities. A huge benefit to the Project Generator business model is that our burn rate (or monthly expenditures) is very low. As such our requirements for cash are much much smaller than a similarly sized exploration company. CEOCFO: What are some of the other benefits of the Project Generator business model for Yale? Mr. Foreman: First is that the partners fund the exploration until �earn-in� is completed, so they take the risk of exploration. This reduces the need for Yale to finance and continual dilution via cash and share payments to Yale for partner earn in. Therefore, it reduces risk to Yale shareholders and protects them from the downside. Finally, Yale will share in any success of exploration by being shareholder. CEOCFO: Why should companies choose to partner with Yale? Mr. Foreman: Yale has an established and extensive contact base in Mexico. We can provide on the ground expertise and be the operator for the project. Yale's expertise allows for low overhead with respect to running projects. In addition, we have already shown the capacity to find potentially significant projects. Then there is Yale's in-house legal team that has the ability to handle all types of negotiations and situations with vendors, contractors and land owners. Finally, there is Yale's management and Board of Directors, which has significant exploration and production experience. CEOCFO: What is your two minute take on gold, commodities, the macro economic landscape? Mr. Foreman: Precious Metals still have a long way to go and I feel that the Juniors have yet to have been picked up as the Majors were last year. I feel that the Junior market is still going to be very robust for at least the next two years. CEOCFO: In closing, why should investors pick Yale out of the crowd? Mr. Foreman: In my opinion Yale is undervalued. We continue to grow and find companies to option our projects. The more projects we have optioned out and the more money our partners spend on our projects the more news and developments Yale will have. It is a business model that grows upon its own success. The more projects we have optioned out the more news on our projects and the more attention Yale receives. The more success our partners have the more value Yale acquires in its share portfolio. By nature of our business model Yale is a growth stock with goals of year over year gains, however, with success by our partners there is always the chance for a significant spike in our valuation and therefore our share price. The Project Generator business model historically has been one of the most successful in our industry. A Project Generator acquires undervalued projects then advances them and/or incubates them. We then look for other resource companies to acquire a percentage interest (an option) by making staged payments, share issuances and exploration commitments over a number of years. Upon successful completion of an option Yale would then have a minority interest in a project but that project would be much more valuable as a result of the dollars spent. - Ian Foreman, P.Geo.